XBoard FBA_MBGDE3624W - Specifications Product Type: Whiteboard Dimensions: 35. 5 x 23. 6 inch magnetic: yes style: wall-mounted reversible: no frame material: silver anodized aluminum Corner Material: ABS Surface Material: Coating Steel Warranty XBoard Magnetic Dry Erase Board comes with lifetime manufacturer's warranty Reminder This white board comes with a clear, protective plastic film. Xboard magnetic white board not only does the Magnetic Dry Erase Board work as an excellent dry erase white board, but you can also post notes and important messages on it with the included magnets. You can choose to mount this board either horizontally or vertically. Perfect for kids. The detachable marker tray can be placed on any of the whiteboard's 4 sides, to keep your writing materials close at hand. XBoard Magnetic 36x24-Inch Dry Erase Aluminum Framed Whiteboard with Detachable Marker Tray - High grade sturdy aluminum frame is built with ABS plastic corners, with no sharp or pointed edges. This whiteboard is compatible with all brands of dry erase markers including Expo. Xboard keeps bringing best writing experience to customers all over the world! Protective, anti-scratch surface lets all dry erase markers write smoothly. Mount the 36" x 24" white board vertically or horizontally with attached mounting hardware. Mounting is easy with the included hardware. Magnetic surface allows you to conveniently hang a calendar or important papers. 0 80653 - Consistent, skip-free writing, vibrant color options and low-odor ink make the kit perfect for classrooms and offices. The dry erase marker ink is specially formulated to be low-odor making it perfect for use in classrooms, offices, and homes. Kit comes with everything you need to get started marking. Spray and expo eraser help you erase cleanly and easily. Versatile chisel tip allows for broad or fine writing. The expo low odor dry erase markers Starter Set has everything you need to get started working on your whiteboard. 6-piece set includes: red, green and Black dry erase markers, blue, a 2oz bottle of Expo white board cleaning spray and an Expo eraser. EXPO Dry Erase Marker Starter Set, Chisel Tip, Assorted Colors, 6 Piece - . Use your colorful eXPO dry erase marker kit to track, schedule, and present. The set includes an eraser, cleaning spray and 4 whiteboard markers in red, green, blue, and black. The whiteboard markers feature bold ink that’s easy to see from a distance and provides consistent color quality. 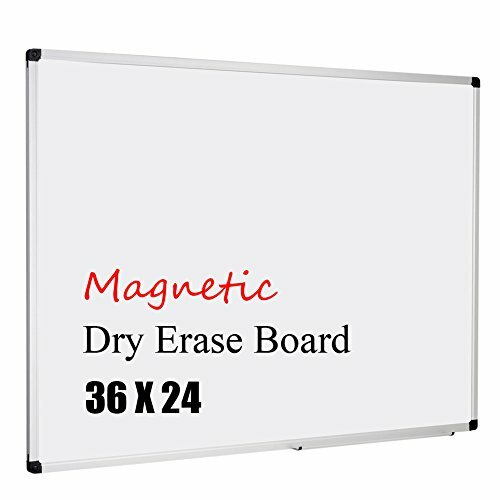 Magnetic White Board | Dry Erase Board | # 1 in Europe | Excellent for Office and Home - 24" x 36"
0 80078 - The dry erase marker ink is specially formulated to be low-odor making it perfect for use in classrooms, offices, and homes. These expo dry erase markers erase cleanly and easily from whiteboards and other non-porous surfaces with a dry cloth or EXPO eraser. Use your colorful EXPO dry erase markers to track, schedule, and present. For optimal results, use on non-porous surfaces such as porcelain or melamine whiteboards and glass. Kit comes with everything you need to get started marking. Low-odor ink formula erases cleanly and is ideal for classrooms, offices and home offices. 6-piece set includes: red, green and Black dry erase markers, blue, a 2oz bottle of Expo white board cleaning spray and an Expo eraser. EXPO Low Odor Dry Erase Markers, Chisel Tip, Assorted Colors, 8 Pack - Consistent, skip-free marking and brilliant color options. Consistent, skip-free writing, vibrant color options and low-odor ink make the kit perfect for classrooms and offices. Spray and expo eraser help you erase cleanly and easily. Expo low odor dry erase markers feature vivid ink that’s easy to see from a distance and provides consistent color quality. Versatile chisel tip allows for broad or fine writing. Versatile chisel tip allows for broad or fine writing. Includes: black, blue, purple, orange, Green, Red, Pink and Brown dry erase markers. U Brands, LLC 581U04-16 - Low-odor ink formula erases cleanly and is ideal for classrooms, offices and home offices. Great for use with any magnetic dry erase board, as the white board eraser includes a magnetic feature, which enables the eraser to be adhered right onto any magnetic dry erase surface. The modern contoured design fits comfortably in the palm of your hand for extremely precise erasing, as well as quickly wiping away all dry erase ink on large writing surfaces as well. 6-piece set includes: red, green and Black dry erase markers, blue, a 2oz bottle of Expo white board cleaning spray and an Expo eraser. Consistent, skip-free marking and brilliant color options. Spray and expo eraser help you erase cleanly and easily. Great for use in any office, classroom, meeting room, board room and more! Kit comes with everything you need to get started marking. U Brands Magnetic Dry Erase Board Eraser, Felt Bottom Surface, 4.5 x 2.25 x 1 Inches - Felt bottom surface of the eraser glides smoothly on any dry erase board surface, without damaging the writing surface. Works well on all melamine, porcelain, painted steel, glass and other dry erase surfaces. Modern contemporary design. Felt bottom surface easily removes all dry erase ink from any dry erase board. Magnetic feature enables to adhere the eraser to any magnetic dry erase board surface. This magnetic whiteboard eraser performs on all dry erase surfaces and erases any dry erase marker ink. Outus - Works well on all melamine, painted steel, porcelain, glass and other dry erase surfaces. Modern contemporary design. Magnetic feature enables to adhere the eraser to any magnetic dry erase board surface. Versatile chisel tip allows for broad or fine writing. Spray and expo eraser help you erase cleanly and easily. 6-piece set includes: red, blue, green and Black dry erase markers, a 2oz bottle of Expo white board cleaning spray and an Expo eraser. Consistent, skip-free marking and brilliant color options. Artist tapes as well: ultra thin gridding tapes can also work as craft tapes, fashion designs, such as creating lines on your scrapbooks, paper crafts, journals, all depends on your artistic mind. Wide uses: these gridding tapes fit for grid creating, blackboard-writings, line charts, and you can use these tapes to distinguish things and mark your paper works, guide lines, etc. Includes: black, orange, purple, blue, Green, Red, Pink and Brown dry erase markers. Contoured design fits seamlessly in your hand for precise erasing. Outus 6 Pack 3 mm Width Graphic Chart Tape Art Tape Grid Marking Tapes Whiteboard Gridding Tape Self-adhesive Artist Tape, Black - Grid marking tape dimension: these chart tapes will come in rolls, 33 m/ 108 feet long for each roll, and the width of the tape is 3 mm/ 012 inch, enough for your use. Graphic chart tape: these chart tapes are in black color, very obvious and general when applied on whiteboard; You can cut to proper length you like, easy to use. MooreCo inc DBA Balt and Bestrite 56389 - Magnetic feature enables to adhere the eraser to any magnetic dry erase board surface. Grid marking tape dimension: these chart tapes will come in rolls, 33 m/ 108 feet long for each roll, and the width of the tape is 3 mm/ 012 inch, enough for your use. Graphic chart tape: these chart tapes are in black color, very obvious and general when applied on whiteboard; You can cut to proper length you like, easy to use. Lightweight hangers fit securely over most cubicle partitions, providing quick and easy accessibility. Includes: black, blue, red, Purple, orange, Green, Pink and Brown dry erase markers. Contoured design fits seamlessly in your hand for precise erasing. Wide uses: these art tapes fit for grid creating, line charts, you can use these tapes to distinguish things and mark your paper works, blackboard-writings, guide lines, etc. Best-Rite Cubicle Whiteboard & Tackboard Hangers 56389 - Useful gridding tapes: ultra thin gridding tapes can also work as craft tapes, journals, such as creating lines on your scrapbooks, paper crafts, fashion designs and so on. Quantity: 6 rolls of black gridding tapes, each roll's length is 33 m/ 108 feet, can meet your everyday needs for marking and lining. For optimal results, use on non-porous surfaces such as porcelain or melamine whiteboards and glass. Mount a whiteboard, framed photograph, tack board, or artwork with ease. Sold in sets of two. Products4Future - Magnetic feature enables to adhere the eraser to any magnetic dry erase board surface. Consistent, skip-free writing, vibrant color options and low-odor ink make the kit perfect for classrooms and offices. We will send you a replacement or refund. Works well on all melamine, painted steel, porcelain, glass and other dry erase surfaces. Modern contemporary design. Low-odor ink formula erases cleanly and is ideal for classrooms, offices and home offices. Versatile chisel tip allows for broad or fine writing. These tiny push pin magnets won't cover up exact things you want to display. 100% money-back guarantee! - don't worry about money, we are so convinced in our fridge magnets that if these shiny push pin magnets don't live up to your expectations, please let us know.
. Mount a whiteboard, framed photograph, tack board, or artwork with ease. Lightweight hangers fit securely over most cubicle partitions, providing quick and easy accessibility. Wide uses: these art tapes fit for grid creating, guide lines, you can use these tapes to distinguish things and mark your paper works, line charts, blackboard-writings, etc. 56 Colorful Push Pin Magnets | 7 Assorted Color Strong Magnetic Push Pins | Perfect to use as Refrigerator Magnets, Whiteboard Magnets, Map Magnets, Calendar Magnets, Office Magnets and School Magnets - Useful gridding tapes: ultra thin gridding tapes can also work as craft tapes, paper crafts, such as creating lines on your scrapbooks, journals, fashion designs and so on. Quantity: 6 rolls of black gridding tapes, each roll's length is 33 m/ 108 feet, can meet your everyday needs for marking and lining. Houseables Ma125 - With this practical tape, you'll never misplace anything again. A staple in classrooms from grade school to University; offices, and kitchens, warehouses, both items are universally used. Works well on all melamine, painted steel, porcelain, glass and other dry erase surfaces. Modern contemporary design. Includes: black, blue, green, orange, Purple, Red, Pink and Brown dry erase markers. Contoured design fits seamlessly in your hand for precise erasing. These tiny push pin magnets won't cover up exact things you want to display. 100% money-back guarantee! - don't worry about money, we are so convinced in our fridge magnets that if these shiny push pin magnets don't live up to your expectations, please let us know. Houseables Write On Magnets Roll, Dry Erase Magnetic Strip, Glossy White, 1 Inch Wide x 25' Long, Wipe Off Labels, Magnetically Receptive Whiteboard Sheet, Board Magnet, for Home, Office - Versatile chisel tip allows for broad or fine writing. Instant whiteboard surface: create your own fully functional dry erase whiteboard on any flat magnetic surface. When magnets and whiteboards become one Here at Houseables, we appreciate when the suffix -able is accurately attached to the end of a word used as a product descriptor. Easy to mount and unmount. But we're sure you'll fall in love with these whiteboard magnets and probably want to order more! Versatile chisel tip allows for broad or fine writing. Use it for stockroom shelf labels, planning boards, factory and office production schedules, tracking your weekly events, message boards, classroom teaching aids, various arts and crafts projects, retail signs, menu boards, and so much more. AgilePacks - Add instant hanging space to virtually any cubicle wall. Mount a whiteboard, framed photograph, tack board, or artwork with ease. Lightweight hangers fit securely over most cubicle partitions, providing quick and easy accessibility. Instant whiteboard surface: create your own fully functional dry erase whiteboard on any flat magnetic surface. Includes 1 Expo fine-point dry-erase marker. Includes 1 10-inch magnetic microfiber cloth - never lose your eraser again! The strong magnet will keep your eraser cloth hanging within reach at all times! Versatile chisel tip allows for broad or fine writing. Wide uses: these art tapes fit for grid creating, guide lines, you can use these tapes to distinguish things and mark your paper works, line charts, blackboard-writings, etc. Useful gridding tapes: ultra thin gridding tapes can also work as craft tapes, paper crafts, such as creating lines on your scrapbooks, journals, fashion designs and so on. Quantity: 6 rolls of black gridding tapes, each roll's length is 33 m/ 108 feet, can meet your everyday needs for marking and lining. Colors Pro Kit - Dry Erase Magnet Kit by AgilePacks for Kanban Board, Agile, Scrum, | 4x6 Reusable Planning Cards Plus Magnetic Microfiber Eraser Cloth and Marker - 8 of each color - gray, pink, blue, yellow and green! 1 expo fine-point dry-erase marker 1 magnetic cleaning cloth Kit comes with everything you need to get started marking.6-piece set includes: red, green and Black dry erase markers, blue, a 2oz bottle of Expo white board cleaning spray and an Expo eraser. Consistent, skip-free marking and brilliant color options. Each refrigerator magnet is 11mm in diameter by 17. Newell Rubbermaid Office Products 81505 - Choose the roll that best fits your project needs. Smooth, you can write smoothly onto the glossy whiteboard front. These tiny push pin magnets won't cover up exact things you want to display. 100% money-back guarantee! - don't worry about money, we are so convinced in our fridge magnets that if these shiny push pin magnets don't live up to your expectations, please let us know. Cleans and refreshes your whiteboard with ease. Grid marking tape dimension: these chart tapes will come in rolls, 33 m/ 108 feet long for each roll, and the width of the tape is 3 mm/ 012 inch, enough for your use. Graphic chart tape: these chart tapes are in black color, very obvious and general when applied on whiteboard; You can cut to proper length you like, easy to use. Expo Block Eraser 81505 Dry Erase Whiteboard Board Eraser, Soft Pile, 5 1/8 W x 1 1/4 H - Pack of 2 - Versatile chisel tip allows for broad or fine writing. It is a clever concept for labeling and organizing a huge variety of areas at home or in the workplace. Three widths and two lengths: houseables' magnetic rolls are available in 1" x 25', and 3" x 10' rolls with. 02mm thickness. Label away in your pantry for maximum cooking efficiency. Easy to mount and unmount. Made in USA.